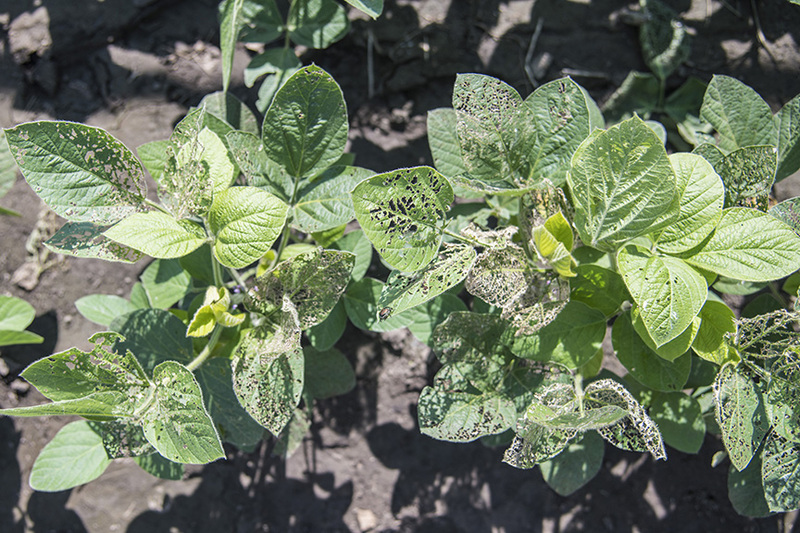 Frustrations have been expressed about the numbers of Japanese beetles and their soybean defoliation this season. 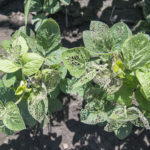 This compounds the weather woes that soybean has endured, i.e., too wet, too dry, too hot, yellowing from nutrient deficiencies, and the herbicides seemingly torching them. I guess the added Japanese beetle defoliation has been the breaking point for some and have resorted to “spray therapy” before treatment thresholds have been reached (see last week’s Pest&Crop). For these producers wanting to “fix” ugly fields, I hope they sleep better at night. For many others waiting for the ECONOMIC treatment, but are getting antsy, consider that we are past the peak beetle emergence. Though Japanese beetle will be around most of the season, their populations will continue to decline. Consider the damage to the newest growth at the top of the canopy, don’t let your eyes fixate on old damage. Happy scouting! Comparing old and new growth damage may indicate that Japanese beetles are declining. 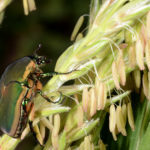 Interestingly, a “cousin” of the Japanese beetle is being reported higher than normal around farmsteads and homes this year, the green June beetle, Cotinis nitida. These beetles appear to be Japanese beetle on steroids, as their coloration is similar but they are much larger. Most noticeable is their audible-buzzing flight around yards and gardens. The adults, like Japanese beetle, will feed on multiple leaves and ripe fruit, but at much lower numbers. Too, the grubs are much larger than Japanese beetle and feed on mostly decaying matter in the soil. Often higher numbers can be traced to old wood lots where roots are rotting in the soil. 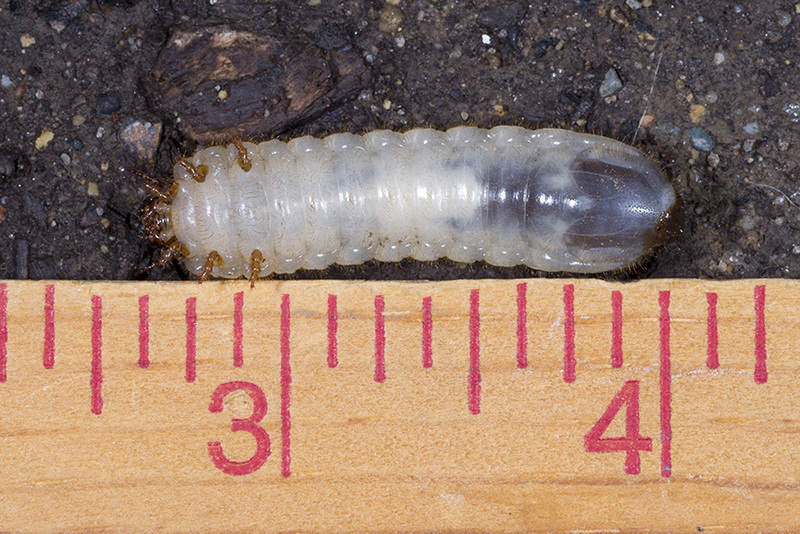 Grubs, found while digging garden beds, etc., in the spring distinguish themselves by crawling on their back while making their escape. 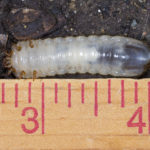 The grubs can occasionally be a pest of finely groomed turf, i.e., golf course putting greens, because of their burrowing and leaving uneven surfaces. 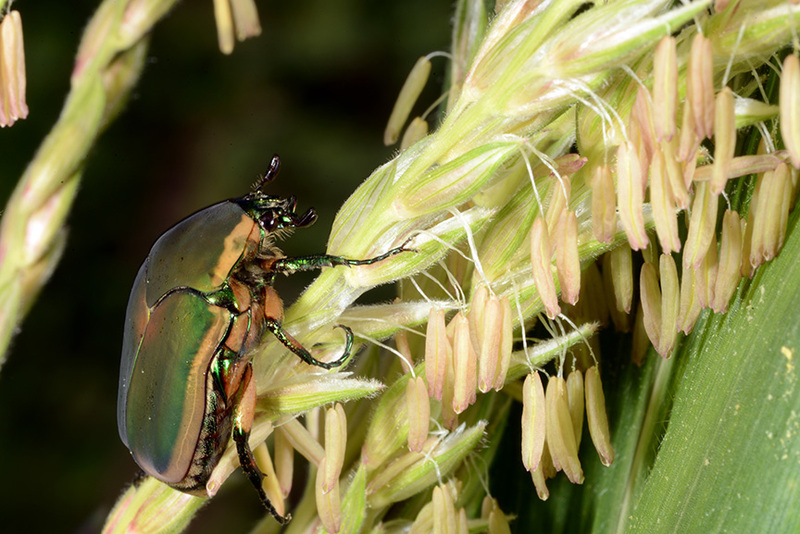 Neither the grub or adult of the green June beetle has been known to cause significant damage to field crops.